Cathy Anne DeBarge 53, of Middletown passed away on Saturday, July 26th, 2014 in Middletown. She was the beloved daughter of parents, Raymond (deceased) and Theresa DeBarge of Cromwell. 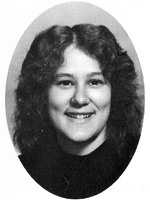 She was a 1979 graduate of Mercy High School. Cathy had a passion for music, both playing it and listening live. She enjoyed summer vacations in Westbrook, CT and Sebago Lake, ME. She also spent summers with her paternal grandparents, the late Raymond and Cora DeBarge of Fitchburg, MA. Cathy had a love for animals, especially her tabby cat “special Ed”. Cathy worked at Pratt & Whitney before starting a nursing career at Cromwell Crest Convalescence Home and Connecticut Valley Hospital. Cathy is survived by brother, Dean, sister in-law, Debra, nephews, James and Mathew, and great niece, Tessarina, brother, Michael, nephew, Daniel, and nieces, Rachel and Erica of Portland, CT, and brother, Ronald, sister in-law, Victoria, nephew, Andrew, and nieces, Jacquelyn and Julianna of Wethersfield CT. Cathy also leaves behind all her special cousins from Leominster, MA. The family would like to say thank you to the doctors, nurses, and physical therapists who helped her through her struggles later in life. A special thanks to Nikki who’s friendship with Cathy was greatly appreciated.